i am a fan of quick. and i’m not talkin’ highly processed or convenience foods. now, i’m not knocking busy folks who need to buy a pre-chopped onion every now and again, but for me chopping the onion is a process that takes me from an over-stimulating day to a place of zen. i’m a strange one that way. 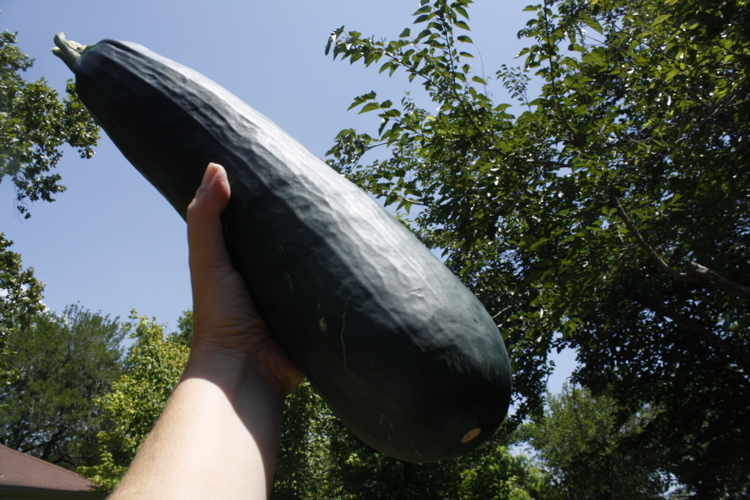 so what we’re talking about here is a quick pickles. canned, or water-bath processed pickles are a wonderful thing, but sometimes you lose quality and crunch factor with this method. plus you have to wait days to weeks for the pickles to be ready. if you have never done this, it is virtually impossible to slave over a hot canner, then wait up to two weeks to taste the results. 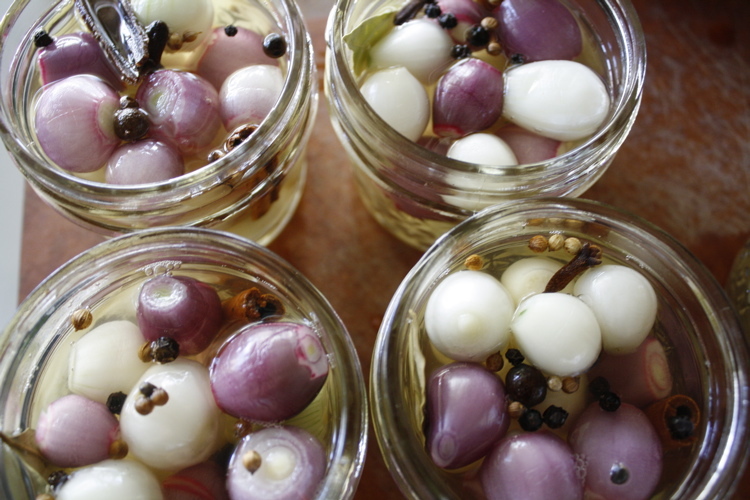 if you are a fan of grilled, smoked, caramelized, braised, broiled or roasted meats or vegetables like we are, you need to make some pickled onions. they are the perfect balance to the char or caramelization that occurs with any of the above cooking methods. i could also see this as the perfect companion to anything warmly-spiced (think cumin or cinnamon scented savory dishes, like the pork carnitas below), or anytime you want to add a brightness to a dish. 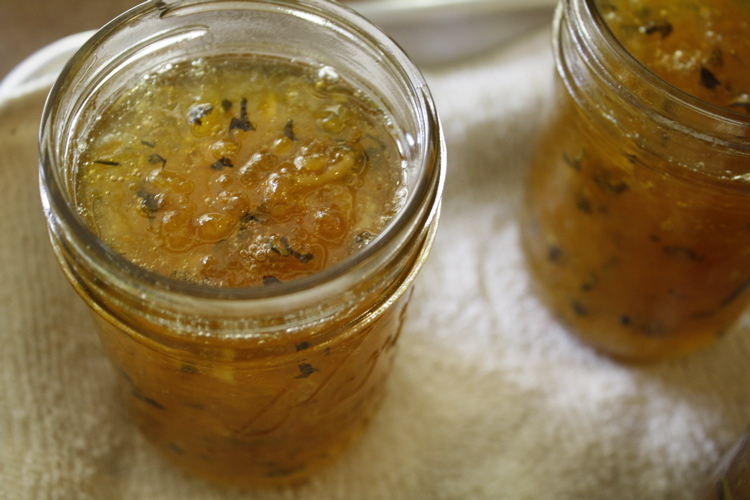 this is such a simple way to punch up so many foods, i think i’ll keep a jar of it in my fridge all summer long. in a small saucepan, heat vinegar, sugar, and spices to simmering. add sliced onions and simmer gently for 30 seconds. remove from heat, transfer to a bowl and allow to cool to room temperature. place onions and pickling liquid in a glass jar. will keep and taste freshest in the fridge for up to a month. 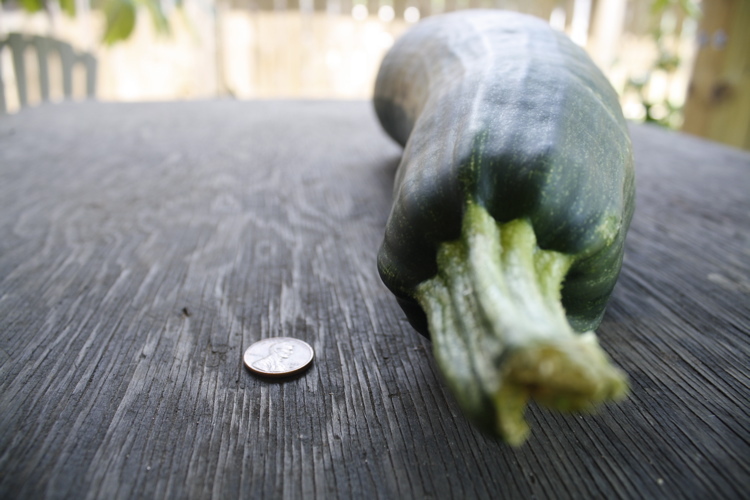 i found this month’s canning assignment a bit challenging. sometimes i think the wider the range from which to choose, the more difficult. this month’s assignment was herbs. herbs! how many hundreds, thousands of herbs are there anyway? i considered most of them. i find i have most difficulty with decision-making when i am a bit over-stimulated by other facets of life. it’s time to admit that my day job is really getting in the way of my blogging, cooking, and social engagements. and something must be done about it. and so to that end, this writing is so close to the deadline that i will have to keep it short. and sweet! 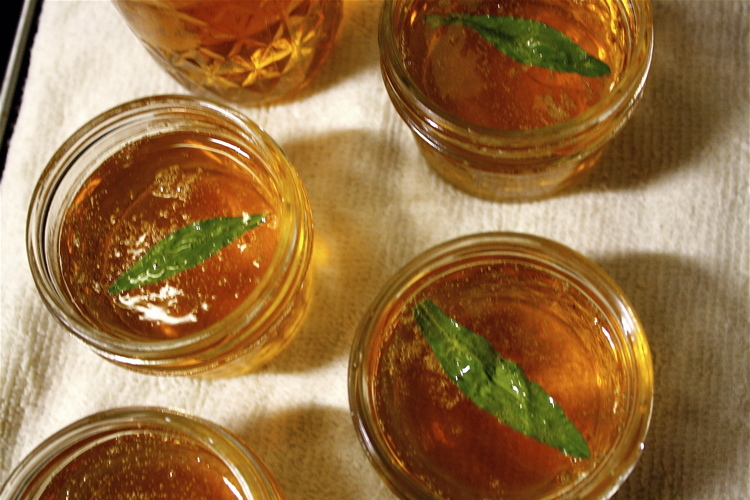 this is a delicious jelly made from a texas viognier and a very special ingredient: mexican mint marigold, aka texas tarragon. this is a lovely herb indigenous to texas and mexico. it is also known as the ‘poor man’s tarragon’. all i know is that it’s a perennial herb that i’ve had it my garden for years and i use it in all kinds of sauces and preparations. 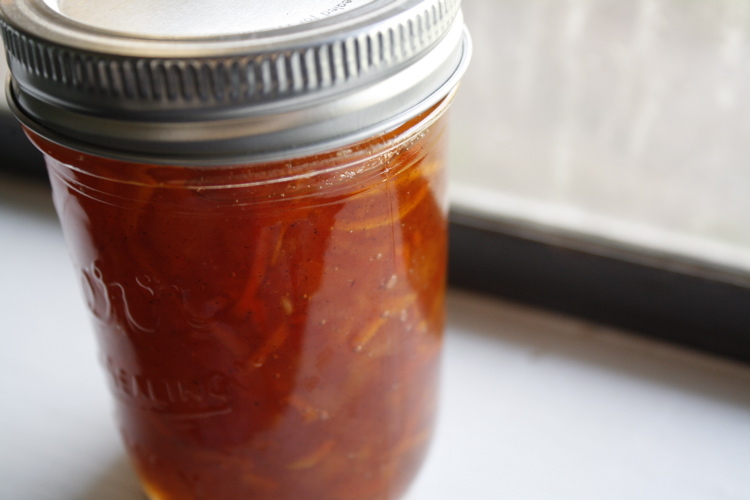 the apple pectin stock is a wonderful way to add natural pectin to jellies and jams. the apple flavor is a bit stronger than i’d like it to be, but the jury is still out. i will taste again this week before i make adjustments. 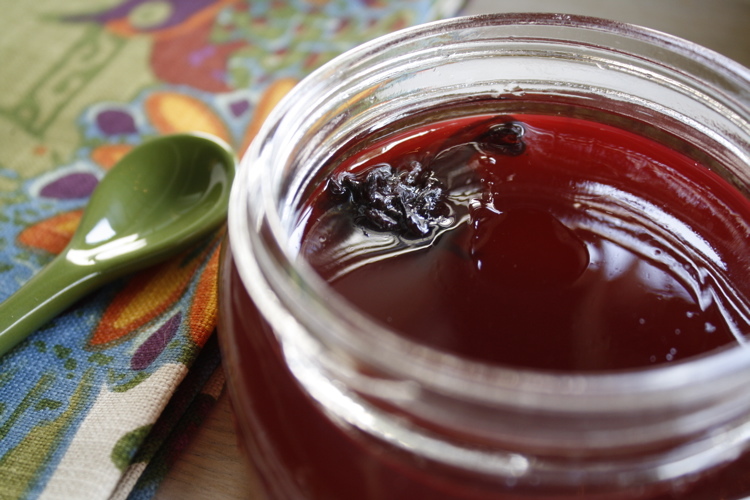 both of these recipes are adapted from gourmet preserves: chez madelaine by madelaine bullwinkel. 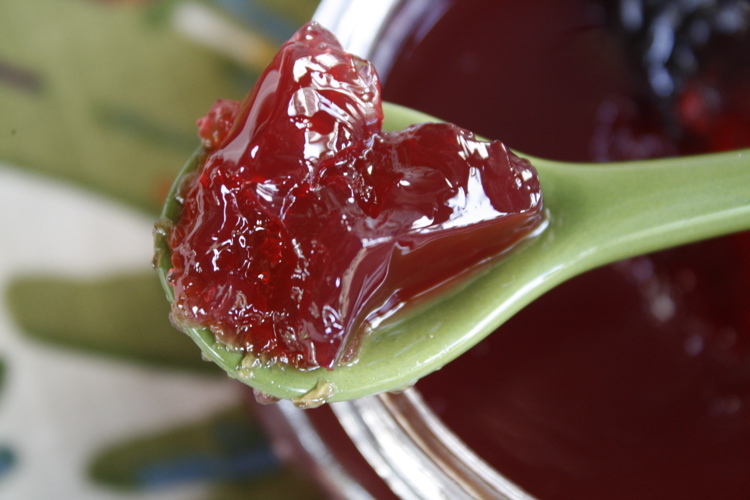 this is a neutral pectin stock that works well with most jelly flavors. keep a store of it in the fridge or freezer so you always have some on hand. 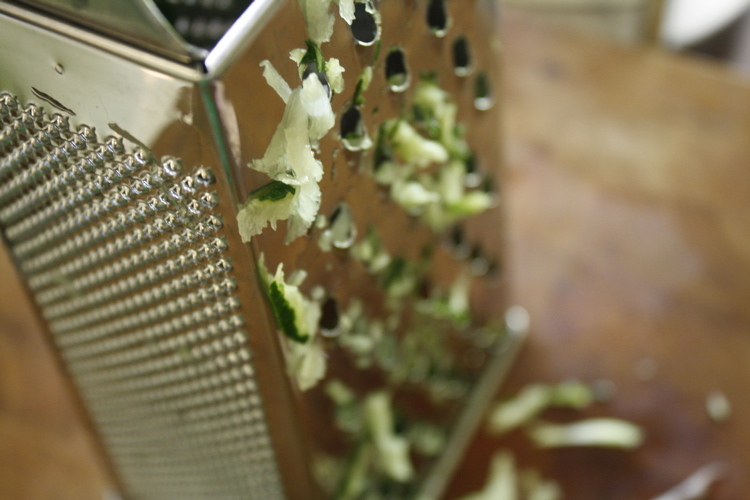 stem the apples and coarsely chop. place pieces in a heavy non-reactive 5-quart pot: include seeds, skins, and cores. bring to a boil, reduce heat and simmer, partially covered for 30 minutes. stir once or twice during this time, turning the apples from top to bottom..
strain mixture through a damp cheesecloth-lined sieve for 1 hour. there will be about 8 cups of juice. begin to reduce this juice while continuing the straining process for another hour. 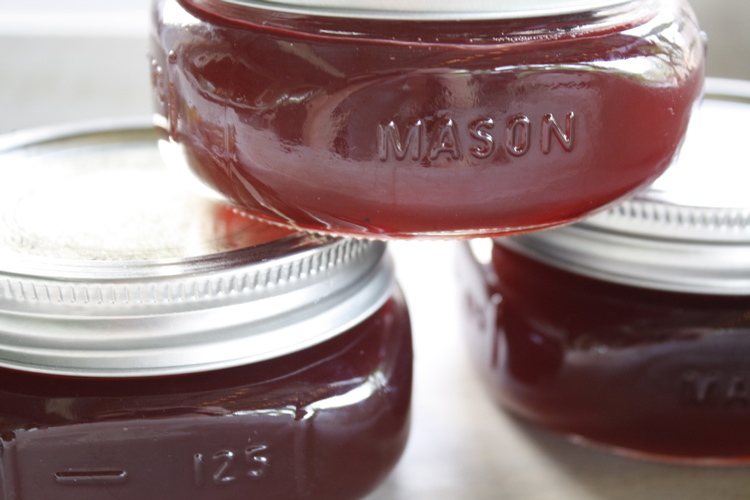 the last strained juice has a higher pectin level than the juices previously strained. 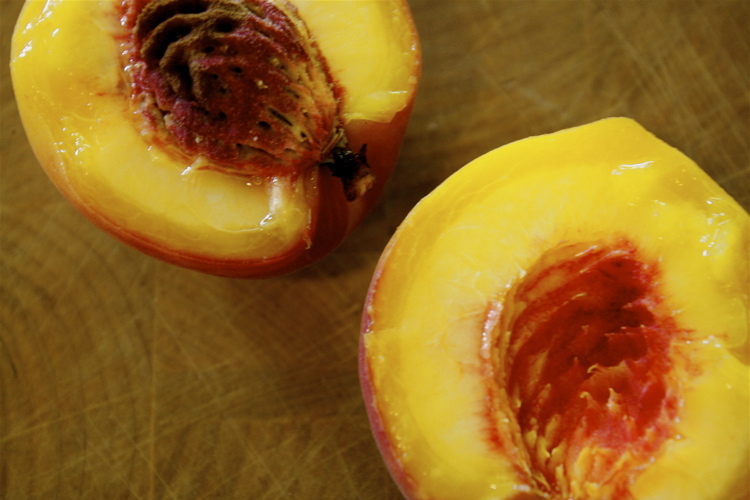 add this juice to the pan and reduce juices to 3 cups total. 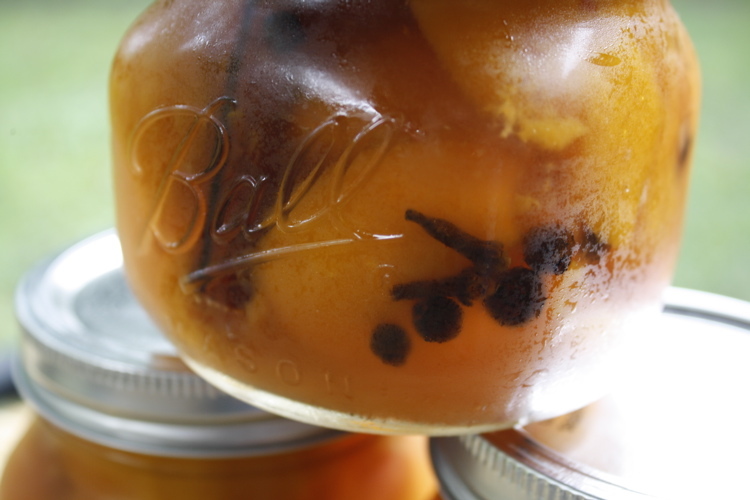 stock will keep in the refrigerator for up to 2 weeks or frozen up to a few months. 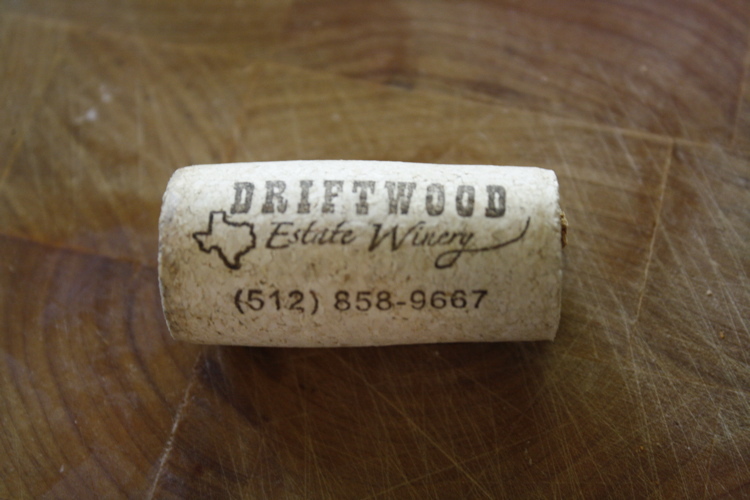 be sure to use a wine you really enjoy drinking because the final product will be a concentrated version of this flavor. reduce the wine to 1 cup in a heavy, non-reactive 4-quart pan. reserve wine and rinse out the pan. combine pectin stock, wine, lemon juice and tarragon in the pan and bring to a simmer, reducing by half to about 2 1/2 cups. remove tarragon. add sugar, 1/2 cup at a time, allowing liquid to return to a boil before adding more. 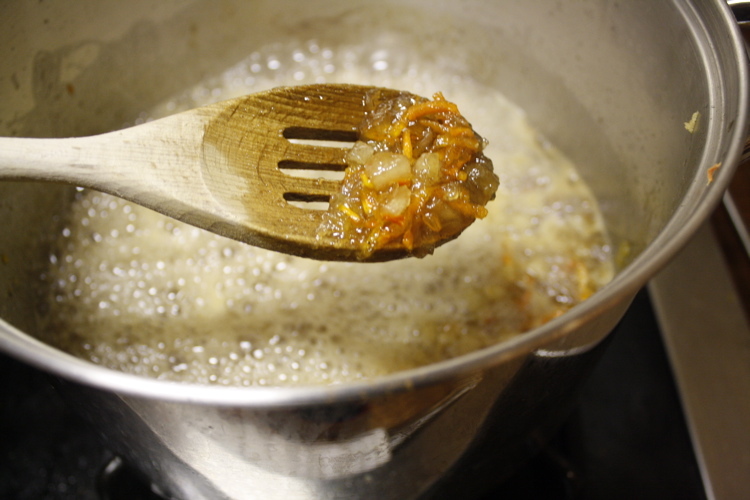 continue to boil until mixture reaches jell-point, about 5-10 minutes. 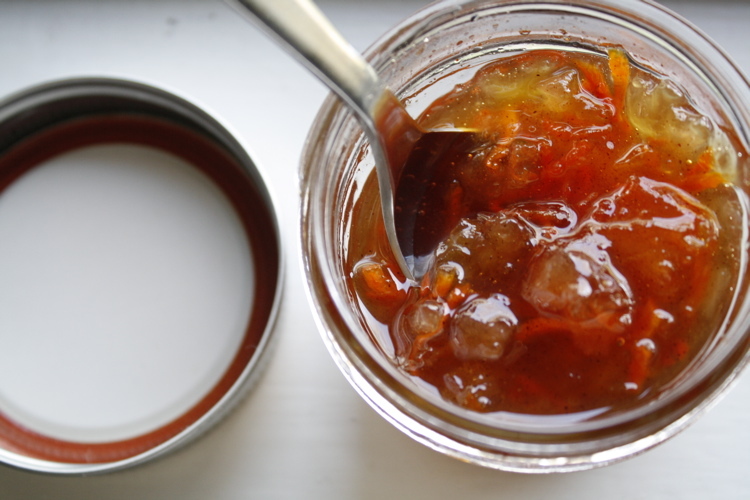 off heat, skim the jelly and ladle into hot, sterilized jelly jars to within 1/4″ of the top. 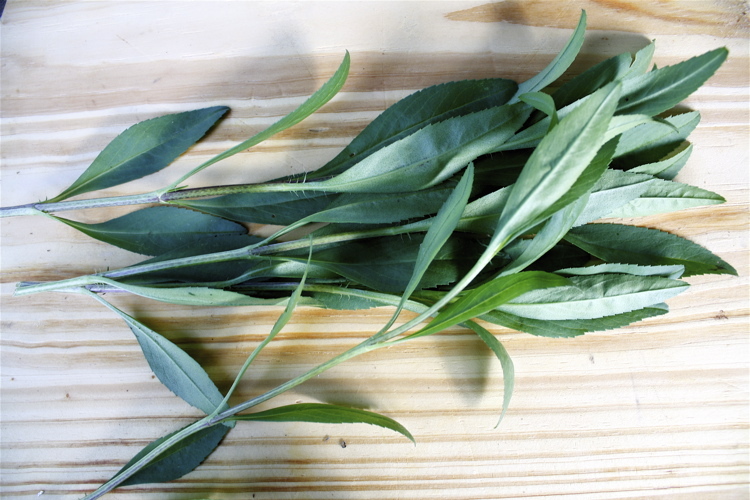 if desired, add a small sprig of tarragon to suspend in jell. process in a water bath for 10 minutes. when i first heard that alliums were the produce of choice for this month’s can jam, i couldn’t have been more excited. i am a savory girl, for sure. i’ll take leek confit over a square of chocolate any day. roasted garlic over cheesecake. and i’d choose caramelized onions before selecting a big bowl of ice cream. i soon learned however that my dreams of canning all of my favorite onion and garlic preparations were being shot down at every turn for one very good reason. alliums are low-acid vegetables and they don’t care who knows it. 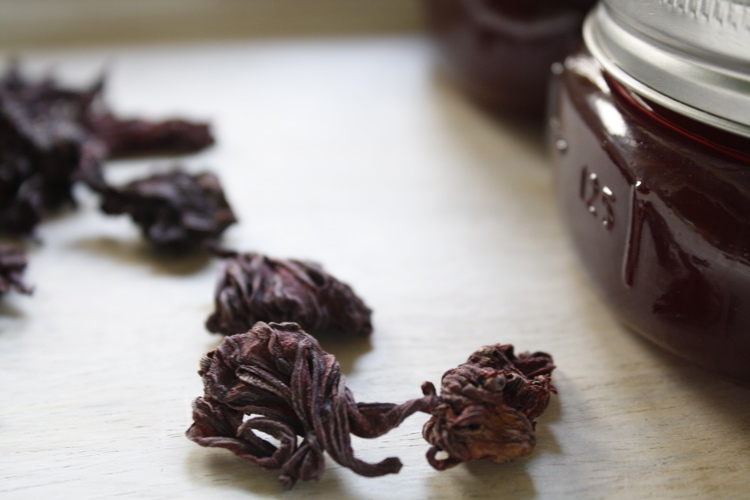 because of this fact, and because i am fairly new to canning, i was having difficulty finding a way to safely can any of my beloved lily family favorites. by the looks of some of the chatter on twitter about this month’s challenge, i am not the only one who was having difficulty. then i sat down and reminded myself that this was precisely reason that i wanted to join the can jam: to stretch my canning muscles. honestly, if it was gonna be so effortless that i would be able to whip up something without any thought process whatsoever, then what’s the point, right? and isn’t that what life’s all about? setting out to do one thing, then quickly realizing it ain’t happening according to expectations and adjusting as necessary? since i usually choose to make quick, refrigerator-style pickles, i decided that canning a pickle would the most logical next step. i settled on pickled cocktail onions more because they are adorable and i love the taste of anything pickled, than for their obvious practical application of fulfilling a gimlet-lover’s dream. 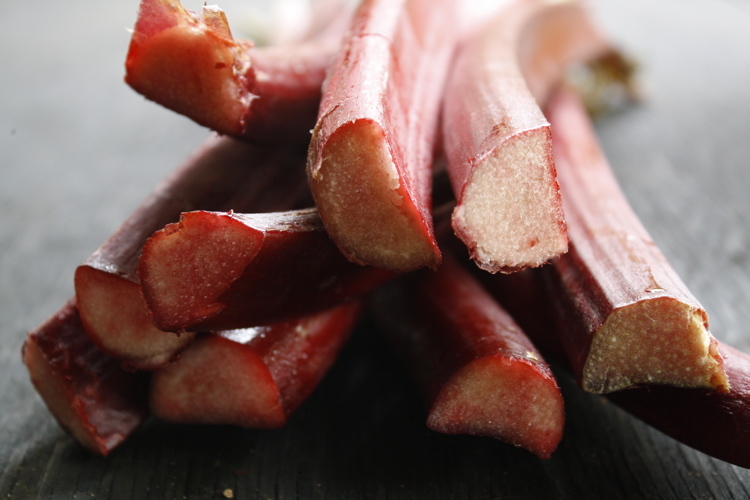 i do plan on giving away a jar or two to the few friends that are known to have cocktail hour, but mostly i will keep them on hand for grilling season, as i imagine their briny little selves will shine next to a pork tenderloin with a nice char or as cooling antipasti. hell, i may even throw them in my next bloody mary. make a brine from 1/4 coarse sea salt (regular iodized salt may turn the brine dark and cloudy and flaky kosher salt may not give the proper proportions for the brine) and 4 cups water, heat gently until salt dissolves, then cool to room temperature. trim the root and stem ends of each onion and peel away a layer or two ‘to reveal the pristine and glassy interior’ (love that description). this may take awhile, so just slow down and revel in the zen of the activity. 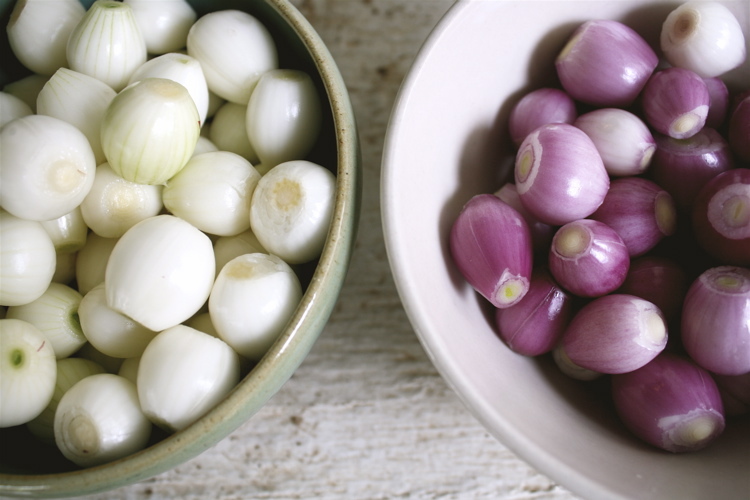 place onions and brine in plastic bags (i used a separate bag for the purple and white onion as to discourage any bleeding of colors) and set in a large bowl to catch any accidental leakage. it was also very easy to keep the onions submerged in the brine this way. brine for a minimum of 12 hours, maximum of 48.
when ready, place vinegar, sugar and aromatics in a saucepan and bring to a boil. simmer for about 15 minutes, then remove from heat. meanwhile drain onions from brine and pack them tightly into sterilized jars. 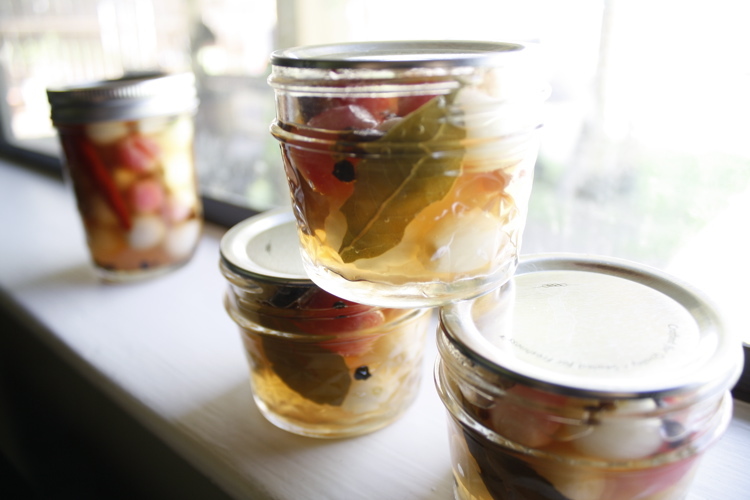 pour brine over onions, leaving 1/2″ headspace, and divide aromatics among jars, adding more if desired. if you are squeamish about heat on the palate, be careful with the hot chiles. breaking them open or adding them to a 4 ounce jar could render the onions rather spicy. process 10 minutes in a hot water bath. the instructions say to allow flavors to marry for at least 2 weeks before using. my goodness, whoever heard of such a thing as carrot cake jam? not me. i think it’s it’s just ridiculous. and delicious. i really thought i was not going to like it but i do. i’m imagining a whole mess of this on top of another whole mess of cream cheese on top of…well, you get the idea. i needed to preserve something with carrots as per the can jam assignment for this month. 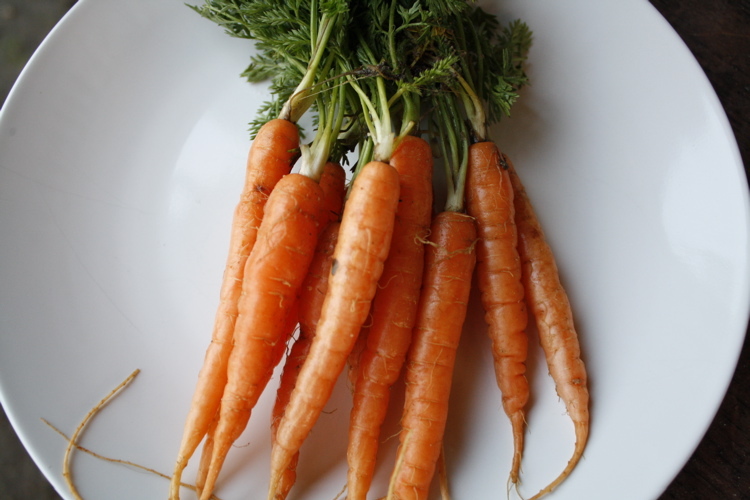 i really thought about canning my mexican hot carrots and eventually i will. but i managed to intimidate myself out of it as the last time i made pickles and water bath canned them, they went as limp and colorless as an old rag doll. i know what you’re asking yourself : does it really taste like carrot cake? the answer is yes. and no. i might’ve made a few changes if i was on top of it before i even put it all together. i would have left out the cloves. unnecessary and i don’t believe carrot cake generally includes cloves. the addition doesn’t seem out of place but it was confusing on the palate in this application. i also would have added some some coconut. yes, that would’ve made it perfect. as it stands, it almost reminds me more of morning glory muffins than carrot cake. 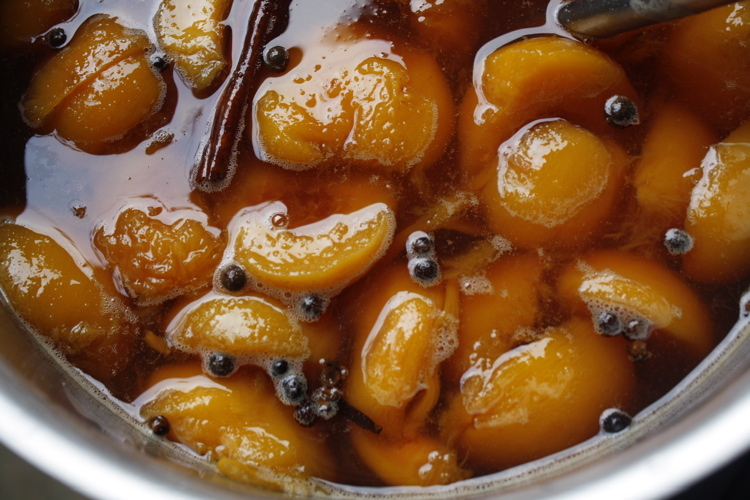 put all ingredients into a heavy bottomed pan, bring to a boil and allow to simmer rapidly until mixture resembles molten sugared lava and mixture reaches about 220 degrees F on a candy thermometer. took me about 20-30 minutes. place a small amount on a plate that has been in the freezer for a bit, put back in freezer for 1 minute. it should be firm and wrinkle some when you touch it. ladle mixture into sterilized jars and process in water bath for 10 minutes. allow to cool completely on counter, checking to be sure all jars have sealed properly. 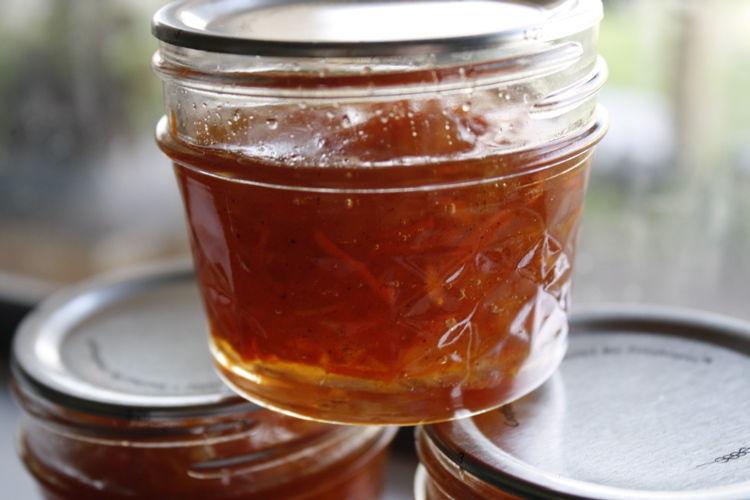 * original recipe called for 6 1/2 cups of sugar (4 seemed sweet enough to my taste) and pectin, which i opted not to use.